More than a month since I last posted here! Didn't seem that long, probably because I have been busy. I shall continue with the Boardwalk story, from where I left off the other time. As said previously, I was very satisfied with the new 9 speed SRAM Attack shifters and the Ultegra RD. The shifting is faster and crisper compared to the stock components. 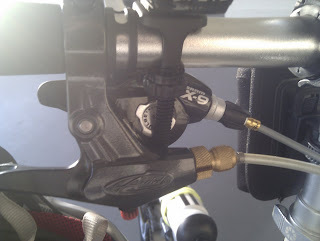 However, I was later presented with a chance to upgrade and try other shifters and RD. This was because there was a new bike! My gf upgraded her bike from the Eco 2 to the Vitesse D7, very nice! Of course, I was also itching to zhng the Vitesse, and upgrade it to a 9 speed bike. So how does this allow me to try another shifter and RD? It is possible because I would need to get another set of 9 speed components to upgrade the Vitesse. Some of the components include Kinetix Comp wheels, 9 speed cassette and chain, 9 speed shifters and a good RD. Also, her preferred shifter is a Shimano type shifter, that uses thumb and finger to shift the gears, unlike the thumb-thumb shifting of SRAM shifters. Of course, this presented a chance to get new components! 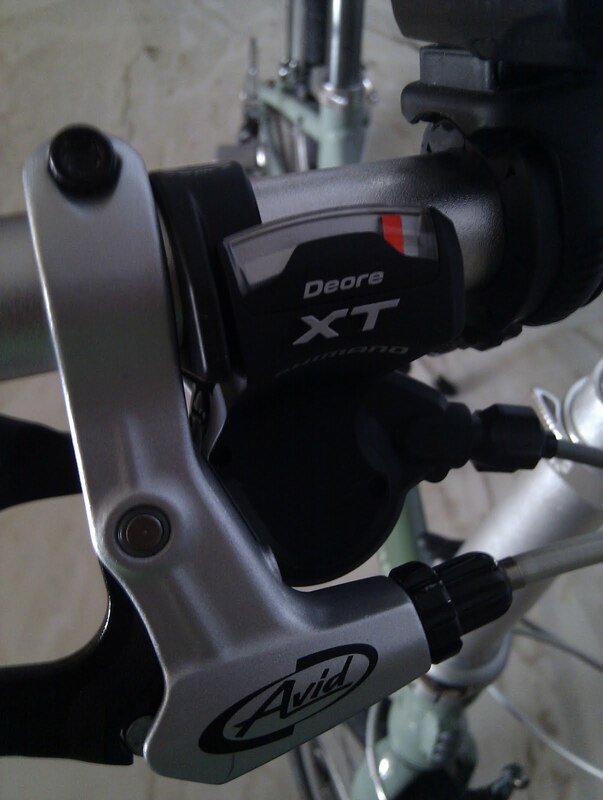 In any case, a set of new 9 speed Shimano shifters is needed, and the XT shifters fit the requirements perfectly. These XT shifters would have to be paired with a Shimano RD, and instead of getting another Shimano RD, I realised that I could just transfer the Ultegra RD over. This leaves the door open for me to get a brand new set of shifters and RD! 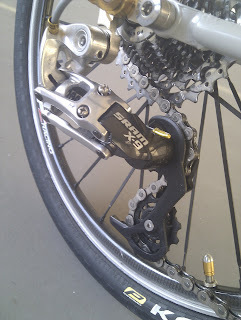 Also, the Vitesse would get an excellent gear system in XT shifters with an Ultegra RD. As for me, I like the thumb-thumb shifting of the SRAM shifting system. It is only logical that I would go with a SRAM system this time. 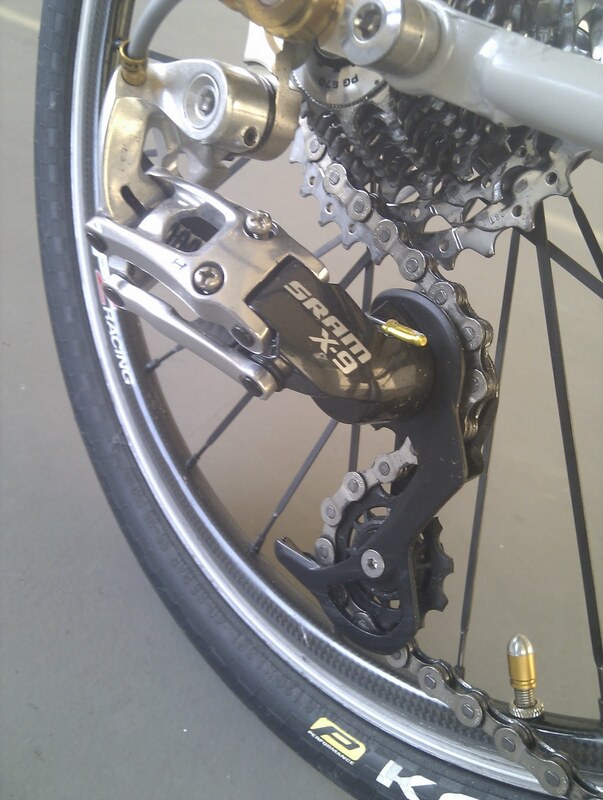 2) SRAM DoubleTap 9 speed +road RD. 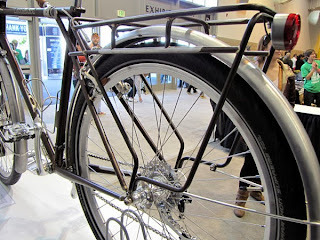 Checked out the 9 speed DoubleTap shifting system at MBS. For those who don't know what DoubleTap is, it is a shifter that uses the same lever for up and downshifts. Pushing the lever slightly triggers an upshift, pushing the lever further will initiate a downshift instead. I couldn't get used to it, because it was hard for me to consistently know how far to push for each type of shift. Also, this combo of DoubleTap and SRAM Force RD is more expensive than the other option. 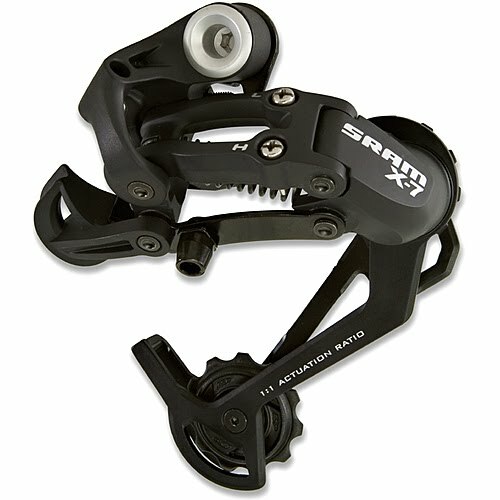 Therefore, I decided to get the SRAM MTB shifter+RD combo. The X9 level is reputed to have an excellent performance to cost ratio, being only slightly below the level of X0, but at half the price. The X7 level is actually also pretty good, at around 70% of X9's price point. But I didn't want to have any regrets if I didn't get X9, therefore I went for X9 instead of settling for X7. With the metal bits on the X9 components, it also looks much better than the all-plastic X7. 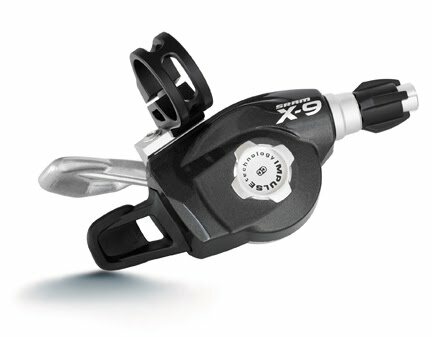 What better shifter to pair with the X9 RD than the X9 shifters? Wanted to get just the right/rear shifter from CRC, but it was out of stock. It was not known when the stock would arrive, and instead of waiting indefinitely, I decided to get the whole set of shifters (left+right) from MBS. The X9 RD was bought from CRC though. Installation of the X9 shifter and RD was easy. Adjusting the cable tension was a bit more tricky, since there is no barrel adjuster on the RD, and it has to be adjusted at the shifter. Also, the routing of the cable to the X9 RD requires more exposed cable. At the same time, the routing also cuts across the end of the quick release. This means that the repair stand, which I use to elevate the rear wheel for maintenance, cannot be attached easily. The shifting performance has already been reviewed in a previous post, when I compared the XT and X9 shifters. Basically the advantage of the X9 shifters over the XT is that they have no free play (termed ZeroLoss) in the big silver lever when downshifting, which allows for even quicker shifts. The shifting quality is comparable with the XT shifting. Very pleased with the upgrade, as it allows me to try both the SRAM and Shimano shifters and RD. 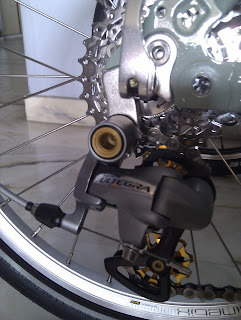 I have also learnt how to install and adjust Shimano and SRAM RDs. 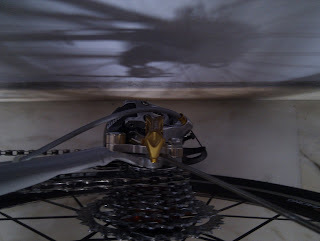 It also works very well, with even more accurate RD movement across the whole cassette. Even though there is no gold bling on the shifter or RD, the silver portions still fit in very well with the overall look of the bike. In the next post, more components are upgraded! 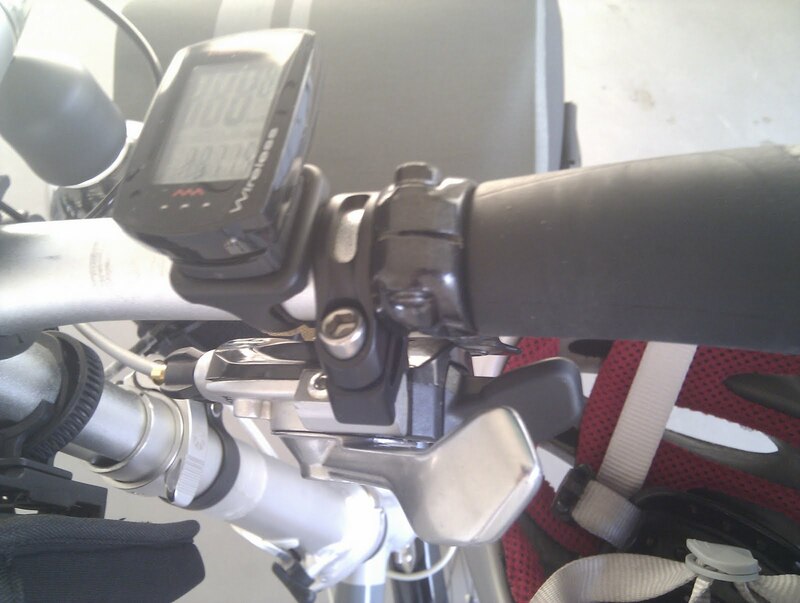 This time, the handlepost and handlebar are upgraded, along with the addition of an accessory, the Biologic Air Horn. Very interesting blog Steve!. And extremely "inspiring" too!. 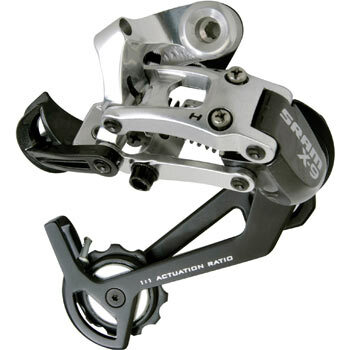 Ok I got a question: if I get the sram x9 9spd RD + shimano 105 cs-5700 10 spd cassettte + sram x9 9 spd rear shifter w/ a shimano 105 FC5600 10-SPD 52X39 (waiting to arrive)crankset will I have any issues while shifting? The chain should be 9 speed or 10 speed? Do you have any suggestions?. Once again thanks a lot for the info, the time and effort to post all of this amazing information! The 9 speed shifter will not work with the 10 speed cassette. At the minimum, you need to match the shifter and cassette. Best is to have all the same number of speeds for the components. Change the RD and shifter to 10 speeds, and use a 10 speed chain. Or, change the cassette to 9 speed, and use a 9 speed chain. Hi Steve, thanks for your blog..I really learn a lot from it. I have just acquired a new Link P9 and planning to upgrade it to 10 speed. Moving the component to my gf Link C7. I'm just a bit confused which drivetrain I should go for, road or MTB. MTB got better option than road. Oh yah, I preferred to have trigger shifter on flat handle bar. Another issue is SRAM or Shimano. Really appreciate if you can provide some comment. On another note do you have any idea if the Neo3 can install on the C7? Thanks for the support! You should use a road drivetrain, as you need a larger chainring to compensate for the smaller wheels. Also, mtb rd are mostly long cage which puts it too close to the rim/tire/ground. Sram or Shimano is up to your personal preference. The shifting ergonomics and feeling is different. I would suggest you try out some bikes before you commit to buy the components. Just remember to match the brand of the RD and shifter. If you are using Shimano 10 speed, you can try the R780 or Tiagra 10 speed flat handlebar shifters. As for RD just get any 10 speed road RD. The C7 can fit any other rd, there is no need to reuse the P9 rd on the C7. It won't fit anyway. That being said, what about this upgrade. You upgraded using MTB component. Is the bike any different? Actually mtb components will also work, just that the rd cage will be unnecessarily long. Do get an rd with low profile such as a Shadow Rd. If you are only using Rd and no fd, using mtb rd and fd will be fine. However, if you plan to use an fd, then it will be tricky as you will need a complete mtb drivetrain, including the crankset. It has inspire me to consider upgrading the drivetrain of my MU P27. Would appreciate your opinions. I am fine with the P27's DD3 hub but the stock 9 speeds X7 RD and shifter are not quite to my liking. I am not sure where lies the problem but they just don't shift that well. A Speed P8 that I once tried out shift better than the P27! Its pretty straight forward. First option is simply going 30 speeds. Do you think MicroSHIFT's Arsis 10 speed RD and flatbar shifter is a good replacement for the X7 RD and the stock dual drive 9 speed shifter currently driving the P27? Next option is to stay with 27 speeds but go for a better Shimano 9 speed RD and shifter? 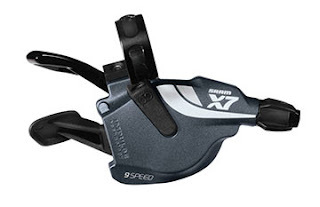 Perhaps the same XT shifter with an Ultegra RD highlighted in your blog? If you are upgrading, just go all the way and get 10 speeds. You will need new RD, cassette, chain and shifters. I think the Microshift components are comparable in performance with the current X7 parts that you have. For better performance, go for at least a Tiagra RD and shifter. But I'm not sure which front triple shifter is compatible with the rear hub. Using a wrong shifter can destroy the hub as the internal parts will be caught in between gears if the cable pull ratio is wrong. Definitely the 3 speeds dual drive shifter is gonna stay. I have read review comparing MicroSHIFT' Centos RD against the 105 or as a cheaper replacement for 105 components and I thought since Arsis is a grade better than Centos so it should be at least better than the X7 RD? Or at least comparable to X9? It is hard to compare these parts, across 3 different brands from SRAM, Microshift and Shimano. They have different design directions and specifications, so it is not just a simple comparison. Go for the tried and tested brand and you will not go wrong. -10 speed cassettes, 105 rd and Tiagra 10 speed shifter and 10 speed chain but use back the original 9 speed crankset. Yes this will work nicely. By the way if you are getting the shifter in a pair, get the double for the left side instead of the triple. This will allow you to use it in case you decide to install a FD next time. Not everything is going my way hence I can only upgrade the rd first when the hanger arrive. RD is a 105 rd-5701 short cage and on the website stated it can only support till 30T. Do you think it can go for 32T since the front is a single chainring, 52T? So the set up will be all original drivetrain except the rd (provided it work with 32T cassette). You should wait for all the parts to arrive and upgrade at the same time. No point only changing RD as it may not be compatible with the cassette and shifter. The 105 RD may be able to take up to 32T cassette if you push it. The B tension screw will need to be screwed all the way in. The RD may have sufficient chain capacity as there is only 1 front chainring, but it might not be able to reach the 32T sprocket due to the angle of the RD movement. What is the problem you are experiencing now? Changing from 11-32 to 12-30 will narrow the range, but you get closer spacing between gears which is nice. Sorry I have not change it yet cause I was wondering if I should use 11-32 since the short cage could only support max 30T. So now I was thinking if I should just stick to 12-30 so that I won't have too much issue. I worried is missing the 32T will make a lot of diff going uphill. Else I just get a medium cage to support 32T. What do u think? Should I get a medium cage? The clearance should be enough? The difference between a 32T and 30T is not too much. Getting a mid cage RD will not work, as it only increases the chain capacity, allowing you to use a front triple instead of front double. The max sprocket size for mid cage is still 30T. If you really want a rear 32T, get a MTB RD and shifter. Or if you are really worried about not having low gears, put on a front double and FD. Hi Steve. Thanks for your patience. I have decided to go ahead with the short cage and use a 11-32T. Will give it a try. Now is the cassette. Can I get a MTB instead of a road cassette? Using either type will be fine. I don't think you can find a Shimano 11-32T road cassette, so just get a MTB cassette. Hi Steve, where did you purchase the RD hanger? I bought it from mybikeshop that time. Not sure if they still carry it. 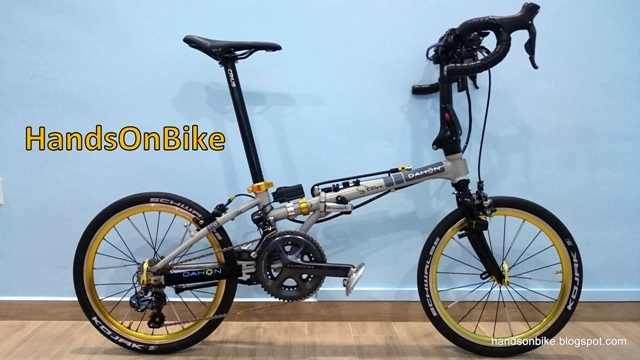 You might find it on Taobao or Taiwan online bike shops. Hi Steve, I need help trying to upgrade to a 18 speed Can you go to C.R.C and make me a parts list. I have a Dahon speed 7. I'm touring in a hilly area speed is good but not a factor. Thanks for any help and you page rocks the industry. Instead of me spoonfeeding you with the list, why don't you do some research and come up with a draft of the parts you want? I can then take a look and advise you accordingly about the compatibility. Thank you so much teacher, I'm going to move to the head of the class. Now off to do my homework Steve. 1. Will the stock Neos 1.0 RD work with 11-34 cogs? If not, what 8 speed short cage RDs would work for that? 2. Would it be much easier for 11-34 cogs for uphill compared to 12-32? What do you think would change in the overall shifting "feel" of the bike? Btw, I am still using the stock 52t single crank. Not sure if the Neos RD can reach the 34T sprocket. Actually a small wheel bike will not need a 34T, a 32T is big enough and not much difference from 34T. A 34T will be easier for uphill compared to 32T, but only by a little. Changing to the 11-32T cassette will widen the gear range, giving you a slightly lower and higher gear. However, since it is still 8 speeds, the gear steps will be bigger in the middle of the cassette, which can make it difficult to find a comfortable Cadence. Thanks for the response. So do you recommend 9 or 10 speed instead? What low budget RD should I choose that still gives a high clearance over the ground if I go 9 or 10 speed on a 52t crank? I suggest getting the Tern Rd hanger and getting a road rd and shifter. Go straight to 10 speeds, you can the 10 speed Shimano Tiagra rd, shifters, cassette and chain. Road rd will have more ground clearance due to the shorter cage. The RD hanger I purchased was LitePro, since it was sold at a cheaper price here (half the price of the Tern RD hanger). As for the road RD, Tiagra can only handle up to 30t max sprocket (as indicated on the Shimano website). Sora does can handle 32t but then its only 9 speed. How about mid cage Shimano mtb RDs? Ever tried using them? My friends do recommend the Shimano Zee but its pricey. I'm thinking Deore (mid cage) rd, cogs, chain and shifter. But would it work with a 52t crank? And does crank size matter if you will be changing the RD and cogs? Deore RD will have a rather long cage too. For shorter RD cage the Shimano Zee is a good 10 speed MTB RD. If you really want a RD that can go up to 32T sprocket, then you will need a MTB RD such as the Zee. Remember to get the wide ratio spec. You can use the Zee RD with 10 speed Deore parts. Should not have a problem with a 52T crankset, however you might need to join 2 chains together for sufficient chain length. Chainring size does not matter if you change the RD and cassette, just that you need a longer chain.